Sopa Ranchera, a Ranch Style Chicken Soup is hearty and healthy with potatoes, savory with chicken breast and brimming with Mexican spices. 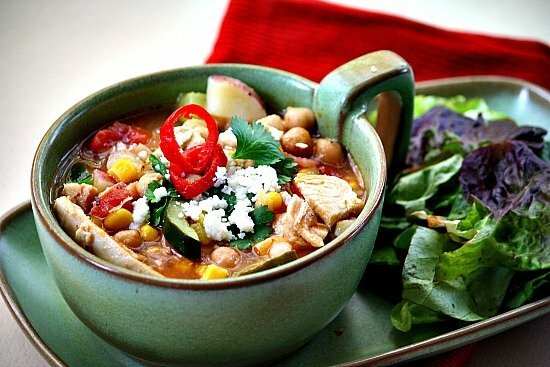 A flavorful bowl of Southwestern goodness for when you need a healthy clean-eating soup recipe. We’ve been eating like Lumberjacks. It started sometime in mid-September. The calorie and fat flood gates were opened and it’s been a steady river of deliciousness since. Its come to a screeching hault as of yesterday. It’s time to take a break and eat clean and healthy over the next couple of weeks, so that the Holiday food gluteney be welcomed with confidence and cheer. The easiest way for us to eat clean without skimping on flavor is a big bowl of soup. Lots of broth, lots of vegetables and lean meats make for a satisfying meal. Here’s a recipe that I found in the January 1999 issue of Cooking Light Magazine and it’s been one of our favorites over the years. 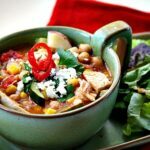 This Sopa Pollo, or Sopa Ranchera recipe, hearty with potatoes, corn, zucchini and chicken breast and seasoned with cumin, Mexican oregano and cilantro, is a flavorful bowl of soup. Don’t forget a squeeze of lime just before serving. You’ll love a kick of zesty citrus to finish the dish. I hope you give this hearty ranch style chicken soup recipe a try. And if you do, please come back and let me know how you liked it and give the recipe a star rating. Your feedback is valuable to me for developing future recipes. And if you have a favorite hearty chicken soup recipe, let me know, I’d love to give it a try. In a saucepan, cover the cubed potatoes with water. Bring to a boil and simmer 10 minutes. Heat the oil in a large Dutch oven over medium-high heat. Add onion and sauté 3 minutes. Add oregano, cumin, and garlic; sauté until fragrant. Add the potatoes and the cooking water, chicken stock to equal 6 cups liquid, and chickpeas; bring to a boil, and cook 5 minutes. Add chicken, corn, salt, and zucchini; cook 5 minutes. Stir in tomato and cilantro; cook 2 minutes. Ladle soup into bowls, and top with 1 finely chopped onion, cilantro, 1 tablespoon sour cream, and shredded cheese. Serve with lime wedges. 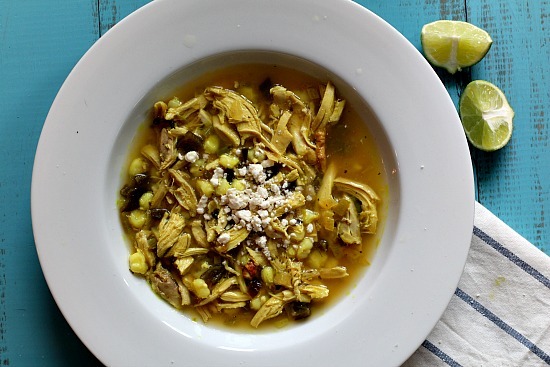 Sopa Ranchera Mexican Chicken Soup …It’s What’s for Dinner. Looks wonderful. Love all the veggies and flavors. We like this recipe Karen. As always, thanks for stopping by and the comment. Nothing satisfies like soup and this looks like one that ticks all the boxes for a a great meal. I will definitely give this one a try this winter. Let me know what you think Karen. I do call this eating light, in a hearty sort of way. At least it’s healthy. I love soup and this looks satisfying. I love Mexican type soups especially. Thanks for sharing. Will try. Thanks Jaime. Sure do miss you blogging. Hope you’re back soon. I’ve been eating soup for a few days now. Helps take away the chill and like you imply-the holidays are not far away! Great sounding soup that will surely hit the spot! Where’s that Mexican cornbread?????? 🙂 Gotta make it this weekend. That Pottery was my mom’s. I always loved those little soup bowls and plates. I can’t think of the company right now, it’s from Oklahoma. I love this way of eating through the winter– soups with added proteins if you need to make a heftier meal. What a pretty bowl and plate and lovely photo! Me too Holly. yay for soup season. This looks like a delicious way to eat clean! 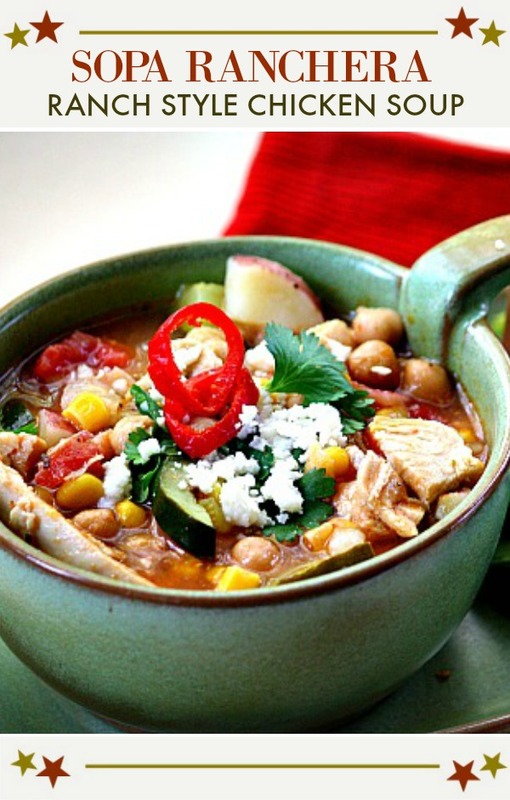 Soup is a perfect solution for eating lighter without skipping big flavor. That’s what I think too Lisa. Big chunks of veggies and chicken and you’re not feeling a bit deprived. And it’s healthy. I HAVE to try this! I’m always trying to spice up my soup-game, and I think this is where I should start! Thanks for sharing, great recipe. Thanks so much for stopping by and the comment. Let me know how you like it. The soup looks great.. and although cleaner and healthier, it still looks mighty filling!!! That’s what’s great about lean protein and lots of veggies. Satisfying yet healthy. You are so right about soup, Lea Ann. It is easy to cut back when dinner is hearty and flavorful. I just have to steer away from the cream based soups and then I do OK. I love all the flavors you have combined here. Thanks Cathy. The more soup I eat, the more pounds I loose and the healthier I feel. It’s a lumberjack conspiracy I tells ya~! What a beautiful soup, Lea Ann! Hearty, flavorful, and super comforting! Knowing that you found the recipe in Cooking Light, I know it is guaranteed delicious! This is one of our favorites Roz. Lean protein and lots of veggies. This looks amazing Lea Ann! I will definitely have to try! So nice to hear from you Robyn. Let me know what you think.